BOLINGBROOK, IL (April 11, 2014) - Gravely took an early lead in the 2014 Mower Madness Championship and cruised to a 64%-36% victory against sister-brand Ariens. “I would have been happy with any result coming out of this final championship match-up but the Gravely fans clearly showed up to play,” said Dan Ariens, Ariens Company President and manufacturer of the Gravely brand. Some manufacturers, like No. 4-seeded Swisher, rallied their employees to vote and managed several upsets before eventually losing in the semi-final round against Ariens. Gravely's social media campaigns played a key role in getting the necessary votes to win. For example, the Brillion, Wis.-based manufacturer found itself trailing Kubota 36%-64% halfway through Round 2. They wisely issued a half-time pep talk on Twitter, encouraging fans to rally to an eventual victory. 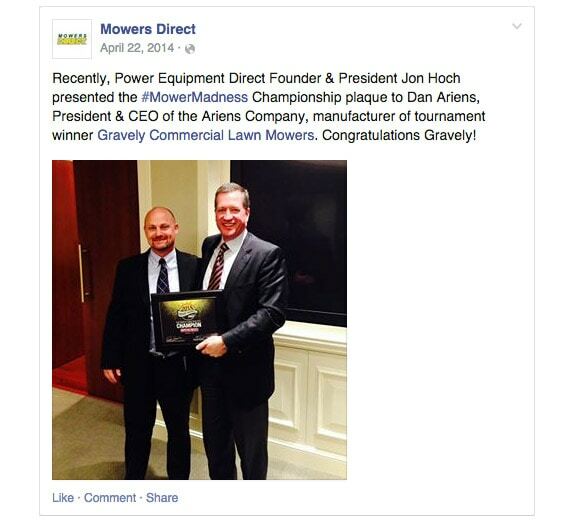 Mowers Direct announces the mower madness winner and the results of mower madness 2014. The product experts chose the mower madness 2014 winner based on sales history and customer reviews. Read recommendations on the final bracket of mower madness 2014 from the experts who work with them every day.